Sunrisers Hyderabad kept themselves in the top-four race as they crushed Rajasthan Royals by 32 runs on the back of an inspiring bowling performance here today. Arguably the most dangerous opening batsman ever to play for India, Virender Sehwag has no qualms in stating that his Kings XI Punjab teammate Glenn Maxwell, who has been tormenting bowlers in the ongoing IPL-7, is more destructive than him and even Chris Gayle. Hockey India has decided to honour the 13 living members of the 1975 World Cup-winning team on May 14 in New Delhi, 39 years after India’s only world title win. India will embark on a redemption tour to England after the ongoing IPL and Cheteshwar Pujara, who is expected to be the team’s batting mainstay, feels it will be tough for the visitors to switch to Test mode from Twenty20 format. The turf war between the suspended Rajasthan Cricket Association and the BCCI escalated on Thursday with RCA Deputy President Mehmood Abdi accusing the Board of acting in the most unfair manner to satisfy the “vengeance, hate and prejudicial grudge” carried by N Srinivasan against Lalit Modi. Chief national badminton coach Pullela Gopichand has set a “realistic” target of reaching the quarterfinals in the upcoming Thomas and Uber Cup Finals. The coach believes that India’s strength, in both the competitions, lies in three single matches. It's sometimes refreshing to see Terry Walsh's ability to look at things as they stand. The national hockey team’s chief coach doesn't believe in making false promises, just a practical approach. Olympic bronze-medallist MC Mary Kom is among the 19 women boxers selected for the core group of probables for this year's Commonwealth Games and Asian Games. Rafael Nadal remained on course to retain his Madrid Masters title with a comfortable 6-1 6-4 win over Finland’s Jarkko Nieminen on Thursday. Real Madrid's La Liga title challenge was left hanging by a thread after a late Humberto Osorio header earned Real Valladolid a 1-1 draw and Cristiano Ronaldo suffered an injury on Wednesday. 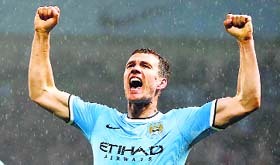 Manchester City moved to the brink of the Premier League title with an emphatic 4-0 win over Aston Villa on Wednesday as Edin Dzeko scored twice to leave them needing just a point from the final game of the season. Hyderabad looked down and out after posting a modest 134 for nine but they came out all guns blazing, forcing their rivals into submission with their fiery bowling, led by young India paceman Bhuvneshwar Kumar (4/14). Kumar provided the first breakthrough in the third ball of the RR innings and then took three wickets in the 18th over to deny the rivals any sort of comeback. His senior pace colleague Dale Steyn (2/33) took two wickets while Karn Sharma, Moises Henriques and Irfan Pathan took a wicket apiece in a collective bowling effort to bowl out Rajasthan for 102 with one ball to spare. The result meant that Rajasthan skipper Shane Watson's superb hat-trick went in vain and Hyderabad moved to fifth from seventh in the points table. It was a pathetic batting display by Hyderabad as more than the Rajasthan bowling, it was poor shot selection of the Hyderabad batsmen that let them down. None of the SRH players, except skipper Shikhar Dhawan (33), applied himself as Watson (3/13) and Rajat Bhatia (3/23) shared six wickets between them. It was a split hat-trick for Watson as he dismissed Dhawan in the last ball of his first over and then sent back Moises Henriques (9) and Karn Sharma (0) when he returned for his second over later in the innings. In his last match also the burly Australian had taken three wickets in one over to trigger a KKR batting collapse. However, Hyderabad made a match out of it with their spirited bowling effort. Both pacers and spinners bowled their hearts out in troubling the Rajasthan batsmen. Asked if the Australian’s top-notch batting reminds him of his heyday, Sehwag responded in negative. “No, no. I was not that destructive. I was a bit, but not that much,” Sehwag said. Talking about what he likes the most about Maxwell’s batting, Sehwag said, “I don’t think he is worried about his game; he’s more worried about golf and practises more golf than cricket. He just goes out there in the middle, gives his 100 per cent out there and comes back happily with whatever he gets.” The Delhi-based player said Maxwell is more dangerous than the strapping West Indian Chris Gayle. “I think Maxwell. He and Miller… if the two of them get going, it becomes very difficult for the bowling side because if one misses a ball, the other makes up for it with a six,” said Sehwag. After scoring a 23-ball 30 in KXIP’s big win over Chennai Super Kings in Cuttack on Wednesday, the out-of-favour India opener said the best is to yet to come from his blade. However, Hockey India has forgotten that the team had a coach too, who happens to be one of the world’s greatest ever hockey players, perhaps next only to Dhyan Chand. India won the World Cup on May 14, 1975. This May 14, HI will honour the 13 living members of the team and present them with a gift of Rs. 1,75,000 each. The 13 players are Ajit Pal Singh, Ashok Kumar, Aslam Sher Khan, Brig. Harcharan Singh, Leslie Fernandez, Varinder Singh, Ashok Diwan, Michael Kindo, BP Govinda, Brig. HJS Chimni, VJ Phillips, Onkar Singh and Kaliah P.E. But the coach of the 1975 team, Balbir Singh (Sr.) won’t be honoured. This omission seems ignorant at best and churlish and mean at worst. In team sports, a squad wins or loses as one — including the coach. The 90-year-old Balbir Singh, however, is a man far from petty or churlish —he’s not bothered that he’s been ignored by Hockey India. He is, in fact, delighted that his one-time wards are being honoured for winning the World Cup. 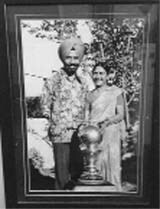 “For me, helping India regain their supremacy in the hockey world was my goal at that time and achieving it, in style, was my reward,” says hockey’s living legend who won three gold medals at the Olympic Games as part of the Indian team in 1948, 1952 and 1956. One of the best centre-forwards in the history of the sport, he scored five goals in the 1952 Olympics final against the Netherlands, which remains a record. “My father always said — ‘Duty First.’ I performed the same. It’s amazing to see the Indian flag going up and people applauding as your national anthem is played,” Balbir Singh says. Does all that matter to the officials? A Hockey India official said: “Following the initiative started few years ago, only players will be awarded under this honour. It’s not that Balbir Singh (Sr.) has not been honoured for his achievements but this time, Hockey India is only awarding the players of the World Cup-winning squad.” A coach builds and leads a team. Sadly, for Hockey India, it was only the winning squad that brought the trophy to the nation. My father died, and my wife suffered a crippling haemorrhage. I never missed a single session of training. Besides these two mishaps, my two younger sons were to appear in the Higher Secondary and Matriculation Final examinations. For two whole months I did not visit my home which was barely a mile and a half away. I kept shuttling between the university campus where I stayed with the team, and the PGI where my wife lay unconscious. I only took a few hours off from the training camp for the cremation of my dear father. The last rites were performed only after I returned to India after the World Cup Victory. 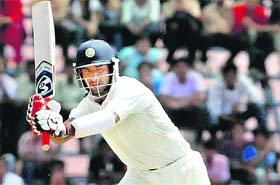 “It won’t be easy at all,” said Pujara. “But the good thing is, we have two practice games before the five-Test series. We will try to make the most of it. We will obviously have some plans to tackle the conditions,” he said of the tour starting with a warm-up against Leicestershire on June 26. Besides five Tests, India will play five ODIs and a T20 International during the tour. In their last tour to England in 2011, India drew a blank as they returned winless from the two-month long trip. India were humiliated 0-4 by the hosts in the Test series, followed by a 0-3 drubbing in the five-match ODI rubber. The Mahendra Singh Dhoni-led side also lost the lone T20 match. Considering their showing in 2011, the upcoming tour to England holds great significance for the Indian team. And Pujara said adjusting to the unfamiliar pitches there will be the biggest challenge for the visitors. “The wickets there are something we can’t have in India and that makes the job really challenging. It is the same for them when they come here and play on spin-friendly wickets,” Pujara said. “The thing which will give me confidence there is the experience of playing in New Zealand and South Africa where I managed to do alright,” said the 26-year-old Saurashtra batsman, who has a staggering average of 58.92 in 19 Tests. A day after BCCI claimed that it acted as per rules in suspending RCA after the Modi was elected its President by a landslide margin despite being banned for life, Abdi said the parent body`s actions were baffling. “The action of the BCCI speaks volumes about its arrogance and disregard for the law of the land and public sentiment, as it has demonstrated with the ban on the RCA in a most unfair and undemocratic manner,” he said in a statement. A Thomas/Uber Cup tie consists of three singles and two doubles matches. India have drawn Germany, Malaysia and South Korea in Group C in the Thomas Cup, while they are bracketed alongside Thailand, Canada and Hong Kong in Group C in the Uber Cup. “Our strength is singles. It has been tough to select the team for the singles as there is very little difference between the players,” added Gopichand, who was awarded the Padma Bhushan earlier this year. India will host the finals of the prestigious Thomas and Uber Cup for the first time to decide the world’s strongest men and women’s teams. The country had hosted Thomas and Uber Cup preliminary stage matches in 1988, 2000 and 2006. Badminton Association of India (BAI) has organised a week-long training camp for the Indian shuttlers. Gopichand, however, felt that it will ultimately depend on how the Indian shuttlers perform on the match day. Gopichand also credited the Indian Badminton League (IBL) for helping the shuttlers prepare as a team for the prestigious championship. “The level we are looking at is the highest in the world. I don’t see our players expecting easy matches. They have played pressure matches in the IBL. They have played as a team in the IBL and that experience will be helpful,” he said. It's sometimes refreshing to see Terry Walsh's ability to look at things as they stand. The national hockey team’s chief coach doesn't believe in making false promises, just a practical approach. For him, setting short term goals for the Indian team to somewhat get closer to the European style of hockey would be of no lasting use. Walsh knows that to be successful, a lot more than skill is required. It's the culmination of many factors that makes the process work. How long, is always the big question in terms of results. "Look, to get this group to where you want them physiologically will take two years to really harden their body and make them play on that international scene. Many of these guys have been playing for a long time on the international scene and they have hardened their bodies, but some of the others haven't. It's difficult both physically and stretching them mentally. It’s part of the whole process and the guys are working very hard. You have to wait," said Walsh. "We are looking for consistency and progression. If you understand the difference between playing the European and Asian styles of hockey, you will know that we have not played any European hockey continually, except for the World League Final in January. You have to start living, breathing, feeling, watching all the games that take place whether it's the European League or the Dutch League, which we hadn't looked at. You have to immerse that European style of playing, and that's different from coming here and training morning to afternoon," Walsh told reporters ahead of the team's practice session here on Thursday. The men's hockey team is undergoing rigorous training drills under the watchful eyes of Walsh and High Performance Director Roelant Oltmans at the National Stadium as part of their preparations for the World Cup. Walsh seemed confident about India's chances at the World Cup and said the boys have the self-belief to succeed at the highest level, which was missing three months back. "Players have that self-belief which they did not have three months ago. It was significantly better than what we were at the World League Final. The European tour was part of the significant development. That has taken us to another level," said Walsh. “With less than 3 weeks left to the World Cup, there are many focus areas during the preparations like introducing new techniques, putting in place strategies keeping the opponents in mind. We are also completely focusing on the development and improvement of each player." Hockey India (HI) today recommended the names of ace drag-flicker V R Raghunath, striker Dharamvir Singh, Tushar Khandekar and former skipper Bharat Chetri for the prestigious Arjuna Award this year. HI announced the names of players and coaches recommended for the National Sports Awards 2014 which include the prestigious Arjuna Award, Dhyan Chand Life Time Achievement Award and Dronacharya Award. The list was prepared after a selection trials held at the IG Stadium here from May 6 to 8 under the supervision of the ad-hoc committee. While Mary Kom and six other boxers were selected in the the 51kg category, seven were picked in the 60kg division and four in the 75kg weight category. Meanwhile, the ad-hoc committee also requested the Sports Authority of India to continue the camp till the Asian Games in all 10 weight categories to enable the core group to train with the best. The selection trials for the men's core group probables in all ten categories will start tomorrow at NIS, Patiala. 51kg: MC Mary Kom, Pinking Rani, Rebeeca, Sonia Lather, Mamta, Sarjubala, Vanlalduati; 60kg: L Sarita Devi, Preeti Beniwal, Pavitra, Pwilao Basumatary, Minu Basumatary, K Mandakini, H Chaoba Devi; 75kg: Pooja Rani, Neetu Chahal, Alari Boro, Seema Poonia, Monica Saun. Nadal looked in fine form as he took nine of the opening 10 games to move 6-1 3-0 in front. Nieminen then briefly threatened a comeback as he broke back and even had break points at 4-4 in the second set, but Nadal held on before sealing victory when the world No. 57 fired long in the next game. Next up for the 13-time Grand Slam champion is a meeting with sixth seed Tomas Berdych after the Czech came through in three sets against Bulgarian Grigor Dimitrov 3-6 6-3 6-2. 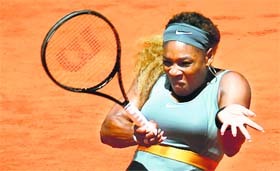 Serena Williams also maintained her quest for a third consecutive Madrid Open title with a 6-2 6-3 win over Spain's Carla Suarez Navarro. Williams was broken twice in her opening three service games, but Suarez Navarro was unable to consolidate the break and once the American moved ahead 4-2 she saw out the set comfortably. More of the same was to come in the second set as Navarro held serve just once and, despite her serve being broken twice more, Williams went on to set up a meeting with fifth seed Petra Kvitova in the last eight. Kvitova was also a winner in straight sets as she overcame Czech compatriot Lucie Safarova 6-4 6-3. The match started badly for Real when world player of the year Ronaldo hobbled off with a suspected hamstring strain. They went ahead, however, when Sergio Ramos, celebrating the birth of son Sergio on Tuesday and his 400th Real appearance, swept home a free kick after 35 minutes. Dzeko's double midway through the second half relieved the pressure that had gripped the Etihad Stadium and late strikes by Stevan Jovetic and Yaya Toure, his 20th of the season, secured a comfortable victory. City, who brought up 100 league goals for the campaign, realistically need just a point from Sunday's home game against West Ham United to win their second league title in three years. Manuel Pellegrini's side moved two points clear of Liverpool at the top of the table but, with a superior goal difference of 13, a draw would be enough for City to be crowned champions while Chelsea's title hopes are over. At the other end of the standings, Sunderland guaranteed their Premier League survival when goals by Jack Colback and Fabio Borini sealed a 2-0 win over West Bromwich Albion which effectively ended Norwich City's hopes of remaining in the top flight. With Sunderland moving to 38 points and West Brom one place above the relegation zone on 36, Norwich are three points further adrift with a vastly inferior goal difference. Chelsea goalkeeper Petr Cech will be sidelined for up to 10 weeks after having surgery on a dislocated shoulder on Wednesday, the Premier League club said. Mumbai: Defending champions Mumbai Indians have roped in Uttar Pradesh swing bowler Praveen Kumar as the replacement for the injured Zaheer Khan for the remainder of their campaign in the Indian Premier League. MI skipper Rohit Sharma tweeted Kumar’s picture in the team’s jersey and said, “Welcome mate, good to have you.” A team official also confirmed the development and said the India discard joined the team today and practised at the nets. Barcelona: Sebastian Vettel (in pic) will have a new Red Bull chassis for Sunday's Spanish Grand Prix in a switch that could give the quadruple Formula One champion a boost even if the team said it was unrelated to his lack of form so far this season. Chief designer Rob Marshall told the Red Bull website on Wednesday that the change, replacing the central tub that the driver sits in, had been scheduled at the start of the season. Australian Daniel Ricciardo, who has outqualified his German team mate in three of the four races so far, is expected to have a new chassis some time in July. Solan: All Saints College (ASC), Nainital, beat hosts Lawrence School, Sanawar, in the final to win the Honoria Basketball tournament in Lawrence School today. Right from the start, ASC pushed Sanawar into a defensive mode. While ASC led 13-8 at half time, the Sanawar girls bounced back in the second half by reorganising their attack through well-coordinated passes and narrowed the lead to 26-22. However, ASC quashed the home team's challenge and in the end won by 13 points. Ludhiana: Gurwinder Singh scored 18 points as Ludhiana Academy thrashed Patiala district 50-32 on the third day of the 65th Junior Punjab State Basketball Championship at Bhaini Sahib today. In the girls’ section, Ludhiana district beat Kapurthala district 50-18, with Kulwinder Kaur scoring 16 points and Aman scoring 12 points for the winners. In another match, Smriti scored 16 points as Amritsar district beat Jallandhar 57-28. London: Louis Van Gaal said on Wednesday he wants to be the new manager of Manchester United. “I would love the job,” the Netherlands boss, speaking at the start of a three-day Dutch World Cup training camp,” said on Wednesday. “I hope that I shall be the one,” added van Gaal, who also said United were the “biggest club in the world”. The 62-year-old has long been the leading candidate to become the next full-time manager since United sacked David Moyes.